The signing of a binding letter of intent with veterinary product manufacturer and wholesaler, Greveling Holding Netherlands and Swiss animal health company, A&H Health Switzerland to develop and commercialise Creso Pharma’s (ASX: CPH) cannabidiol (CBD)-rich hemp-derived nutraceutical products for the global pet care market paves the way for CPH to enter the global veterinary health market, currently valued at more than US$25 billion, and according to Mordon Intelligence, expected to grow to $39.7 billion by 2021. This should be considered as a high profile partnership given Greveling Holding BV is the owner of the prestigious proprietary Prequine line of equine products. The group is a manufacturer of complimentary feed for sport horses, as well as being a wholesaler of veterinary products, exclusively supplying high quality consumables to veterinary hospitals, surgeons, pharmacists and practitioners, as well as servicing government and research institutes and specialised licensed pharmacists. Greveling’s understanding of regulatory procedures and requirements in the Netherlands and the broader European region should be extremely beneficial for CPH at a stage when it is looking to bring new products to market. Similarly, A&H is a Swiss animal health company certified by the Swiss licensing and regulatory authority, Swiss Medic, allowing it to facilitate product distribution into its domestic market. This partnership is in early stages and investors should take this into account and seek professional financial advice when considering CPH for their portfolio. It is also worth bearing in mind that CPH is targeting other markets in the Middle East, the Gulf region and Latin America in order to maximise its share of the global pet care market. Greveling BV will assist in distributing products into these regions. 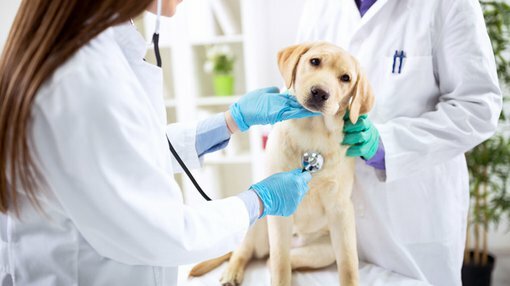 As a means of gauging the size of the European pet healthcare market alone, it is expected to grow from US$8.4 billion in 2016 to $11.4 billion in 2021. CPH intends to capitalise on the substantial void that exists in terms of gaining access to CBD nutraceuticals with veterinarians who have previously had to make compromises in the treatment of ailments such as anxiety, pain, seizures, arthritis and inflammation through the use of poorly adapted human therapeutics. CPH’s veterinary products address the aforementioned ailments by regulating how the animal feels pain, eats, experiences emotions and utilises its memory. Importantly, the company’s products contain compounds from the hemp plant which are similar to the endocannabinoids produced by the animal’s body, but will not contain any THC (the psycho-active compound in the cannabis and hemp plants). The endocannabinoid system is a unique control regulatory system in all vertebrates and is involved in the regulation of numerous physiological processes that affect many important physiological functions as referred to above. The primary function of the endocannabinoid system is to maintain a stable internal environment despite changes in the external environment. Diseases and ailments often emerge when there is a deficiency or dysfunction of the endocannabinoid system and the endocannabinoids produced in the body. 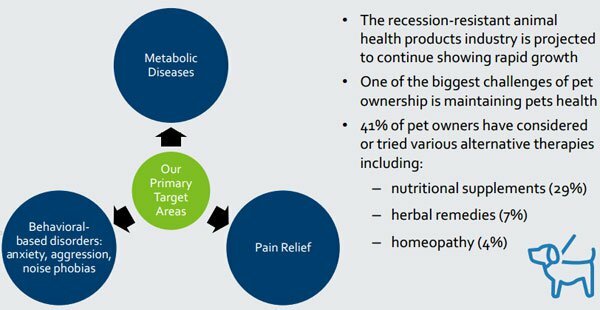 The aim of Creso Pharma’s CBD-rich veterinary nutraceutical products is to supplement deficient and unbalanced naturally occurring endocannabinoids with the phyto-cannabinoids from the hemp plant to help an animal’s body restore homeostasis and synergise naturally with its endocannabinoid system, creating better overall health. As highlighted by CPH Chief Executive and Co-Founder, Dr. Miri Halperin Wernli, people increasingly view pets as members of the family and are willing to spend heavily to promote their health and well-being. With pet owners themselves now choosing botanically derived products over synthetic supplements for human ailments, CPH expects this trend to create demand for similar treatments that can be applied to pet healthcare. Potential investors should note that forward-looking statements in relation to upcoming opportunities are estimates that may or may not be met, and independent investment advice should be sought if considering this stock. 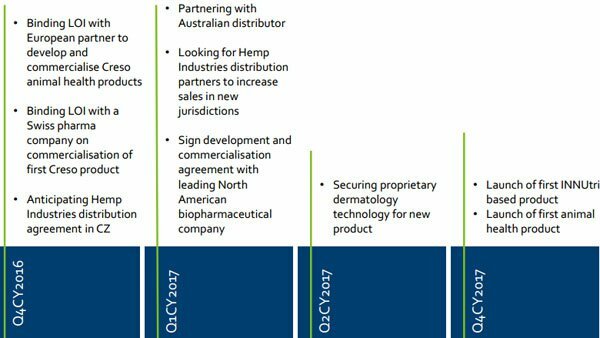 As can be seen below in the company’s strategic plan for the next 12 months, it is only relatively early in the fourth quarter and CPH has achieved two of its goals. With significant events potentially occurring over the next six months, including the anticipated first quarter 2017 negotiation of development and commercialisation agreements in the important North American biopharmaceutical market, there is scope for CPH’s share price to rerate strongly. CPH’s share price retracement that has occurred over the last week is arguably a function of profit-taking (after trading at a near 100% premium to its IPO price on October 25) and weakness in the broader market with the plunge in the S&P/ASX All Ordinaries index from more than 5500 points to less than 5300 points coinciding with the downturn in the company’s share price. Consequently, this may represent a useful entry point. However, investors considering this stock shouldn’t base investment decisions on anticipated share price movements. Independent financial advice should be sought before investing in CPH.